New Year’s Eve marks the beginning of all the things you’ve been meaning to do but haven’t gotten around to doing. It feels like a fresh start but in reality if you don’t put your mind to it, nothing has really changed from the year before. That’s why I wanted to put together my list of 10 Blog Resolutions for 2019 that I will be constantly thinking about and want to work towards in the New Year! If you don’t have faith in yourself, how will you be successful? It is the passion that you bring to your work and sharing the things that you love that will make your blog successful. Always have confidence in what you do, positivity and have a good mind set. One thing that I told myself I would get into is making beauty and hair tutorials for all of you. I have made a couple of shorter length videos for Instagram but overall I haven’t dedicated enough time and space to this. I did create my YouTube channel and for 2019 I hope to actually get some real content out there for you all! On that note, what sort of material would you like to see on my YouTube channel? Comment below! I have been wanting to attend NYFW for years now but haven’t had a chance to successfully clear my full time work schedule to make that happen. As a little background for all my new followers, I do full time work as an Accountant in the corporate world which can mean long hours. But honestly this year I hope to attend NYFW in the fall and get to meet all of you! I try to stick to a Tuesday and Thursday posting schedule and also an Instagram schedule as well but sometimes life happens and sticking to a schedule falls off track. This year I want to set a schedule for myself and be able to shoot content ahead of time in order to meet my goals! In order to do that I will use a planner (or even this white board that I saw on pinterest)! A lot of bloggers post about similar topics during certain times of the year (i.e. sales, hot items, makeup) but what will make your post more attractive to readers than other bloggers? What hasn’t been done yet? In a sea of thousands and thousands of blogs, it’s those creative and one-off things that really make a blog stand out from the rest. 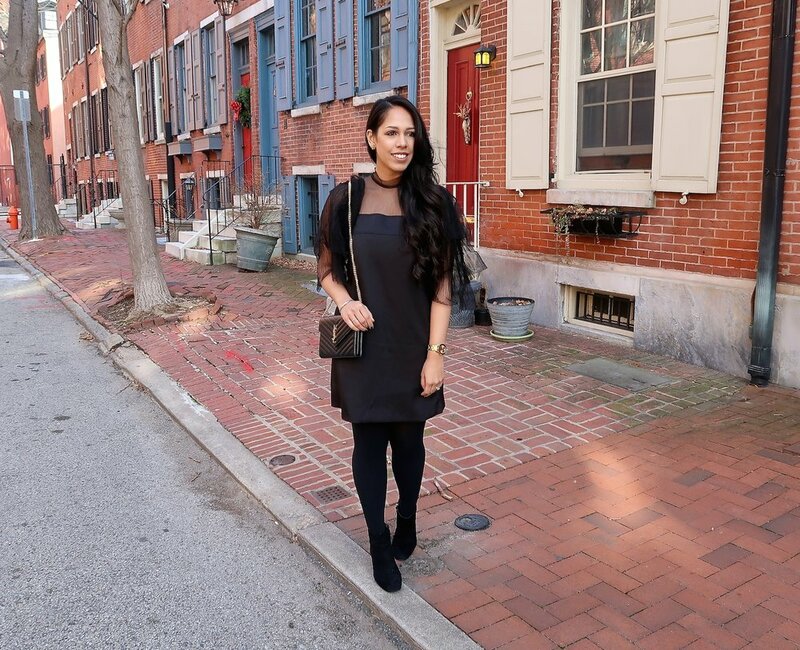 Philadelphia has an amazing group of bloggers and I haven’t had a chance to meet much of them! I have chatted with many through social media (mainly Facebook and Instagram) but I hope for 2019 to attend more events and to network and meet all of you! I can be such an introvert when it comes to these types of events and getting out of my comfort zone is something that I really hope to achieve in 2019. Some of the best relationships can start from social media! Personally, I really want to grow my social media accounts this year, particularly my Instagram account. I have been working on this and honestly Instagram has become so complicated with all its algorithm changes! I need to post more consistently on Instagram and also use my Instagram stories a lot more! I really would ideally like to be at 10K followers this year! This year I hope to collaborate with more companies and especially local Philadelphia companies! I also scored my first paid blog post this year which felt amazing and I hope to have many more! Blog expenses can really add up from paying for a website, paying for apps, and paying for clothes/makeup. In a world where social media is constant, being in the moment whether it be with family, friends, etc. is so hard to do. It’s good to put away your phone, table, computer (whatever you may have) and just be in the moment with those that you love. Last, but not least, it’s so important to make personal time for yourself away from everything. Especially in this industry things can get exhausting and draining - it’s really important to rest and re-charge in order to stay focused. What do you hope to achieve in 2019? I would love to hear your resolutions! I can’t believe the New Year, 2019, is just around the corner. For this year I am loving all the glitter, glam and sparkles! 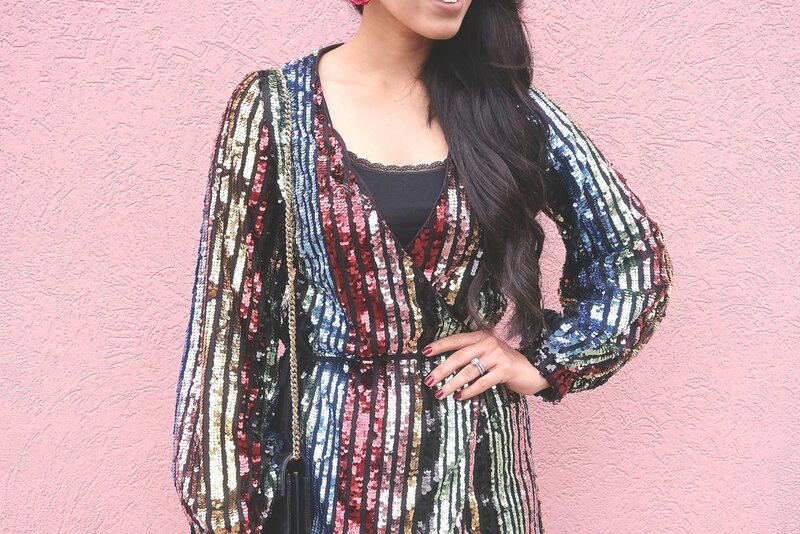 I found this amazing rainbow sparkly mini dress from ASOS and knew I had to have it for our New Years Eve celebrations. For NYE, I will be in Arizona (actually I am currently here) at my in-laws house and we will be here through the New Year. Each year we go to a big NYE party and we always have the best time with family and friends. What a great way to start the New Year! I also received the most beautiful statement earrings from a company called Violet and Brooks. Violet and Brooks designs beautiful pieces with a modern vintage vibe. They also donate a percentage of all profits to the Covenant House, an organization that helps homeless youth and teens. Violet and Brooks designs are pretty, flirty, fun and also well priced! 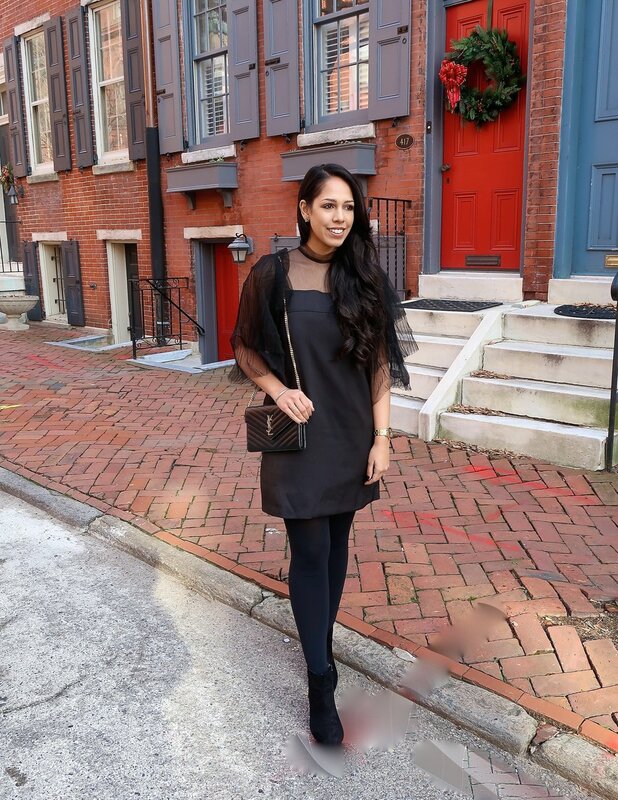 Here are my top outfit picks for New Years Eve! I can't believe it's almost New Years! As the clock is ticking down, it's always a last minute scramble to find the perfect outfit for New Years. One thing that I love about New Years is that you can literally wear ANYTHING! 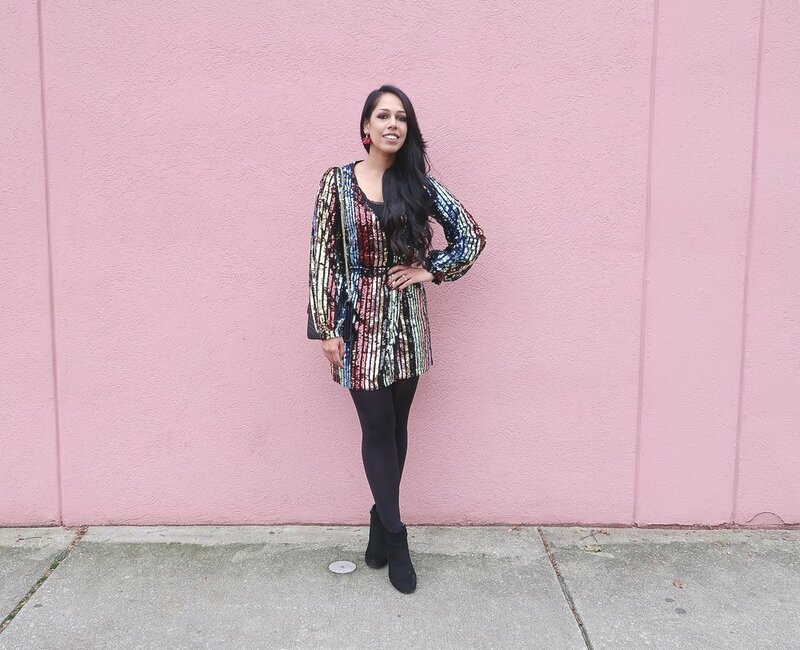 So pull out that mini sequin dress in the back of your closet or your favorite glitter pants and get ready to rock the night out! 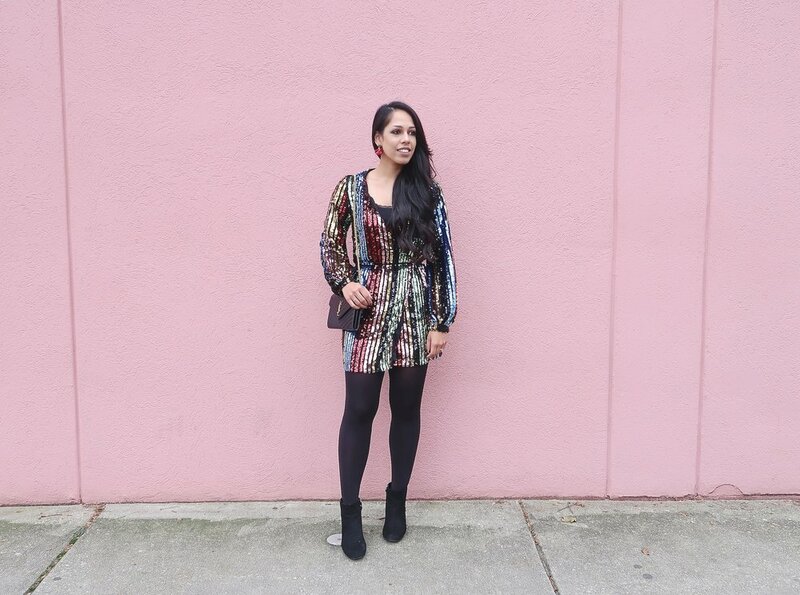 I rounded up 25 of my favorite dresses below! Click on the photos to shop. 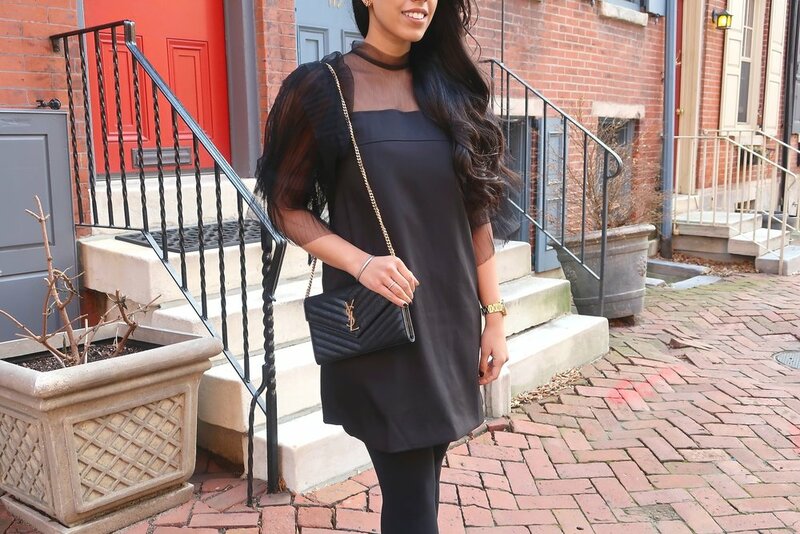 New Years Eve Outfit Ideas To Ring in 2016! I can't believe 2015 is coming to an end. Here are a few last minute New Years outfit ideas if you haven't gotten your outfits picked out yet. I love all of these picks - from sequins, lace, jumpsuits, feathers, capes, A-Line dresses... the options are endless! 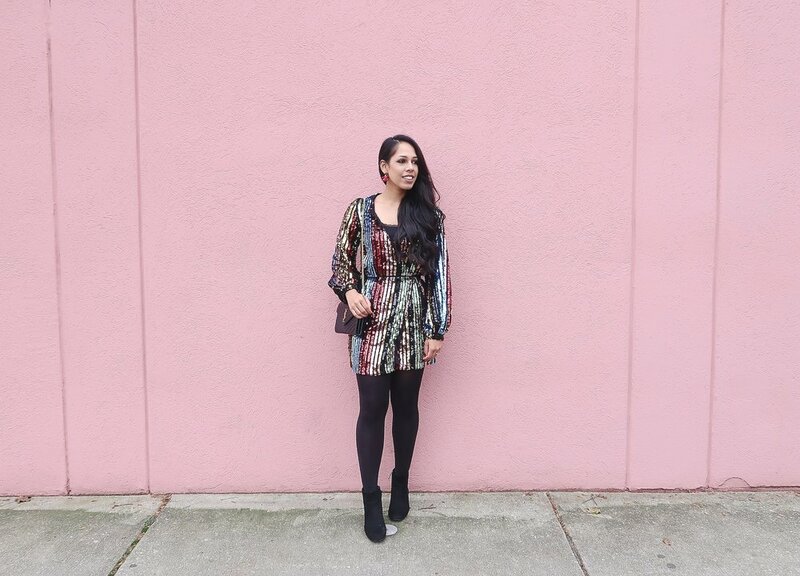 PS: Most of these dresses are on sale right now during Nordstrom's half yearly sale! On a sidenote, this year has been filled with many new fun experiences. None of this would have been possible without any you! There will be many new fun posts and a variety of new projects coming in the next year and I hope you're as excited as I am. It's been such an amazing year and I can't wait to see what 2016 has in store!